The idea of writing this blog goes back to year 2014 during one of my SAP implementation in India where there was requirement to have Automatic packaging items generation at time of outbound delivery. without maintaining Predefined packaging instruction and packaging condition records which in short is termed as Automatic packing. This concept of Automatic generation of packaging materials as delivery item is completely different than automatic packing. There are gamut of packaging bottlenecks which business faces and requirement is to have an easy SAP standard solution to cater their needs. I am listing some of my experience during my implementation projects or during my manufacturing days which I used to witness. 1) Business conducts its shipping process by packing the Items into a Handling unit and ship them out. The shipping Item is packed with a Drum or Cylinder which shipper wants as a returnable item. Business needs to track the each drum or each cylinder. 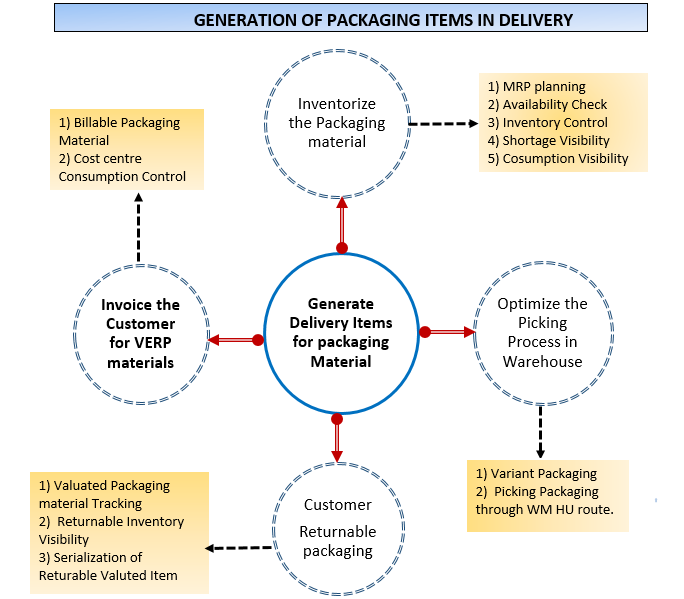 2) In most of the manufacturing industry, packaging items are procured and consumed against Cost centers, kind of indirect purchasing where the Inventory control visibility is completely lost here. 3) Some manufacturing business has requirement to charge or bill the Packaging material to the customer because Product Engineering has done the product costing considering Main FG+ AUXILIARY Packaging separately considering valuated Packaging material cost. They need to have 2 legs in delivery, first leg will be Finished product and second leg will be of packaging materials but it should trigger automatically. 4) The next requirement is to pick an Available packaging material which is in stock. A product can be packed into 10 different kinds of packaging based on availability and that control needs to be triggered at time of outbound delivery Creation, a kind of Variant Packaging. Reconciling all the above points, I am writing this blog to conduct a scenario having the below characteristics. Warehouse Storage type is Storage unit managed. 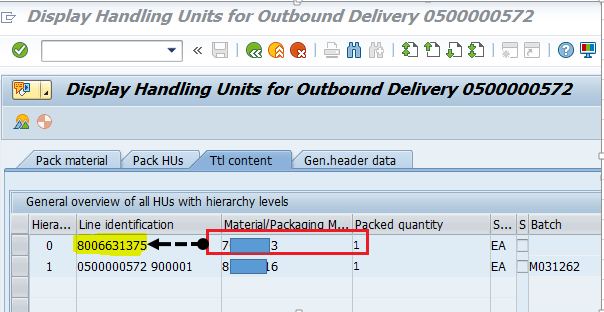 So with one SAP standard functionality of ”Generation of delivery items for Packaging materials of Picking Unit” 4 different business requirement can be mapped. So, when ever I conduct outbound delivery and at stage of PGI, my Packaging material should be defaulted in Outbound delivery and the quantity to be consumed will be purely on business decision. 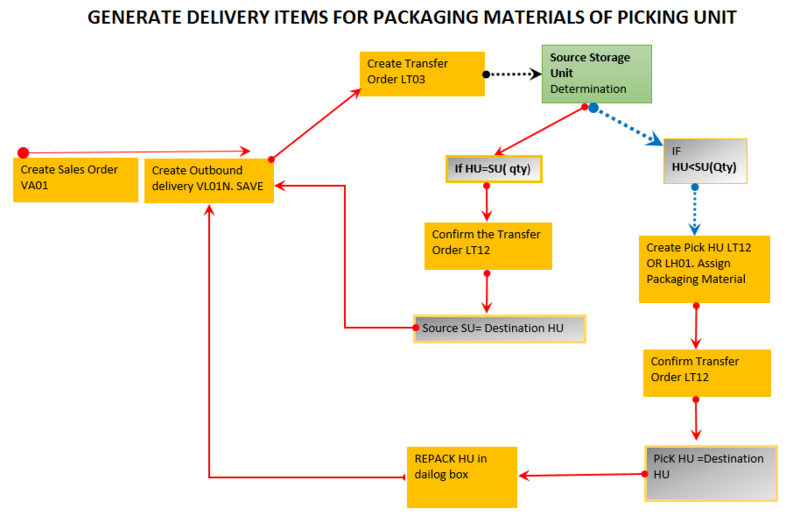 Since there are complexity in HU-WM managed location as we cannot conduct packing directly in outbound delivery, below flow chart will explain contours of this process. You need to configure Packaging material group, packaging material type and a corresponding assignment of Packaging material types to packaging material Group. My Packaging material group is 0002 and packaging material type is 1000. If you look into the material master of Packaging material, i have done settings in packaging material type to pick Plant. 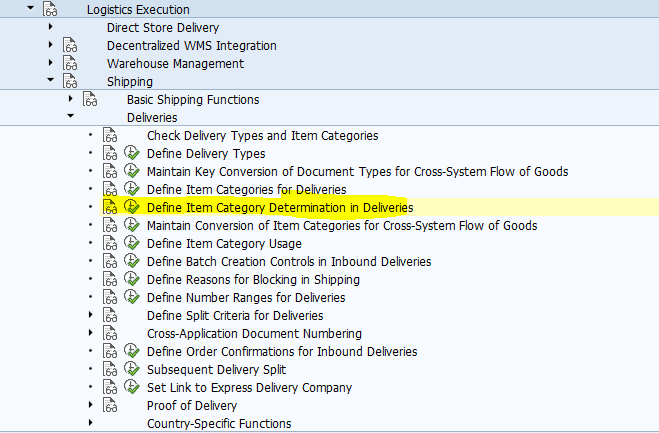 Plant determination is very important and Generate delivery items settings as described below. SO type is ZGCS, Item category group is ZGCS, and item category is ZGCS. Setting can be found in 0VLK for delivery type. 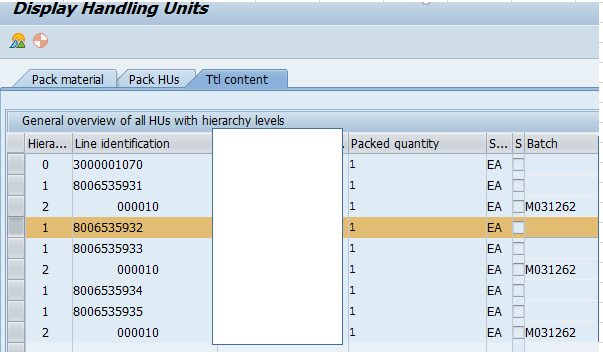 PACK is for packing and CHSP is for batch split as my main FG is batch managed. 4) Created an Outbound delivery as below. Delivery has only one leg as FG. 5) Create a Picking order. I picked a required storage unit manually. I didnt let the system to pick the storage unit via the picking strategy of storage type 801. 6) Since my Picking requirement is only 1(HU=1), however, the storaGE UNIT=4, hence we need to create a pick HU. Mention the required packaging materials which needs to be picked from storage unit. 7) If we look into the picked Storage unit 3000001070, it is a nested HU. 9) Lets check our original outbound delivery now. Packaging material 70011113 automatically generated in delivery. Delivery has 2 legs, 1 leg is Main FG and 2nd leg is Packaging material. 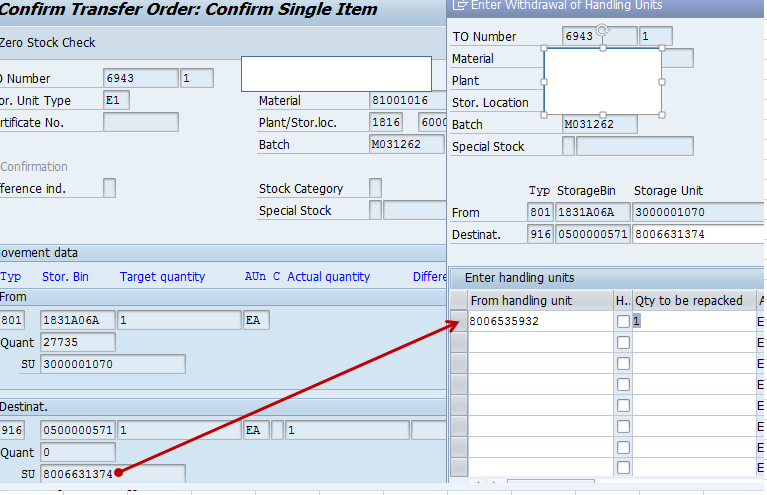 The packaging material is assigned with handling unit as highlighted. The whole process has been very well explained in below SAP KBAs. Focus to be made on below diagram to obtain this requirement. 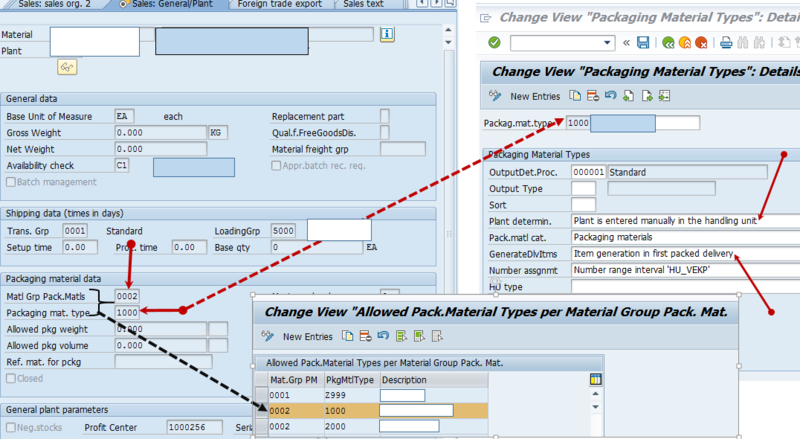 If all the 4 configuration are correctly met, packaging material will be referenced in outbound delivery automatically. 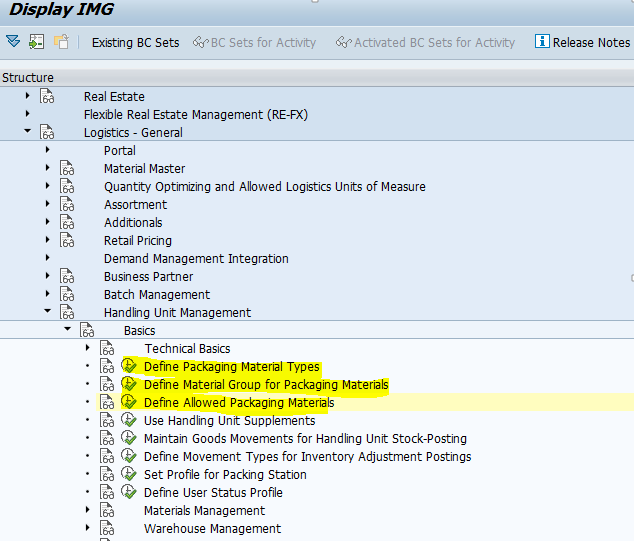 So, once PGI is done, billing document will be generated and it would encapsulate the FG cost +Packaging material cost. So, in this way, we can bill packaging material to customer in delivery. 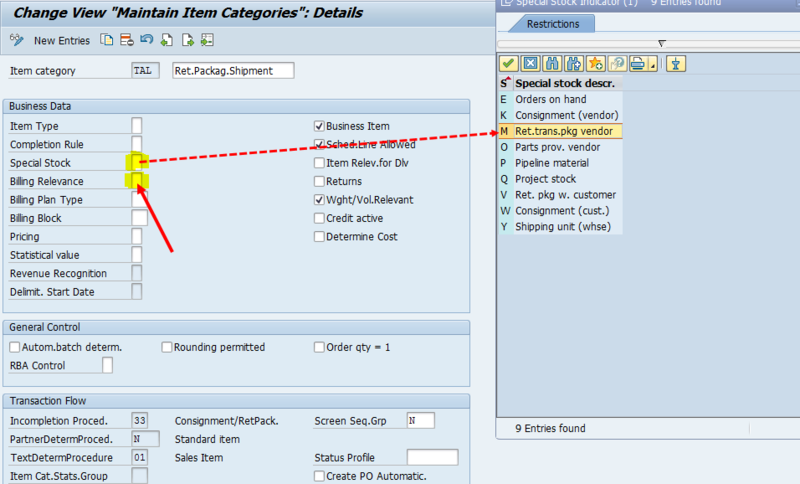 The item category of packaging materials will be TAL and all above configuration needs to done. 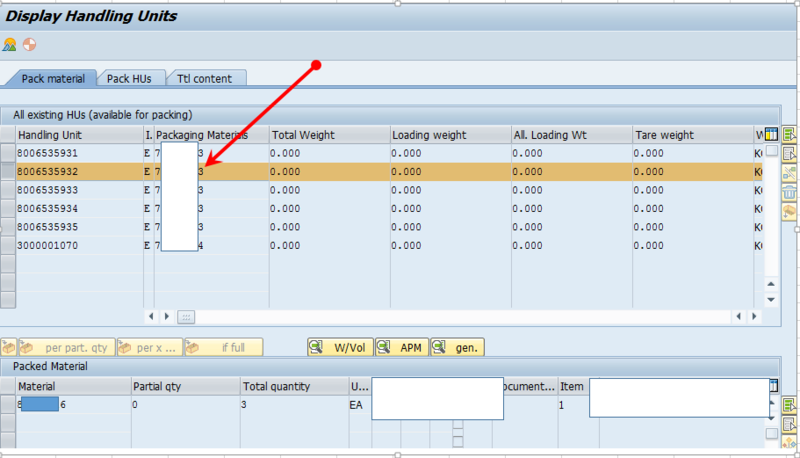 A look into the TAL item category, item category TAL is used for returnable packaging items, it is non relevant to billing and you can think of assigning a special stock indicator for stock differentiation. I would try to write a separate blog on Returnable packaging logistics in Handling unit managed warehouse to encapsulate the Inbound and outbound process comprehensively. I would like to express special thanks to Mr. Juergen Pitz who found the error as I was continuously failing to complete this cycle. You can view our discussion here. Here the topic ends. I would wait for readers message if any corrections are required. Well done , thanks for your good effort. just want to say thank you for your document. it’s really helpful and give insight. Thanks for sharing a detailed explanation!